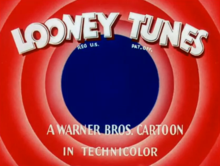 Looney Tunes opening title used in the 1947–1948 season. Looney Tunes' name was inspired by Walt Disney's musical series Silly Symphonies. They initially showcased musical compositions whose rights were held by Warner's music publishing interests through the adventures of cartoon characters such as Bosko and, after losing him, Buddy. The animation studio gained a higher profile, however, following their addition of directors Tex Avery and Chuck Jones and voice actor Mel Blanc. From 1942 to 1964, Looney Tunes and Merrie Melodies were the most popular animated shorts in movie theaters. Looney Tunes has since become a worldwide media franchise, spawning several television series, feature films, comic books, music albums, video games, and amusement park rides, as well as serving as Warner Bros.' flagship franchise. Many of the characters have made and continue to make cameo appearances in various other television shows, films, and advertisements. The most famous Looney Tunes character, Bugs Bunny, is regarded as a cultural icon and has a star on the Hollywood Walk of Fame. Several Looney Tunes films are considered among the greatest animated cartoons of all time, and two (Knighty Knight Bugs and For Scent-imental Reasons) have won Academy Awards. In the beginning, Looney Tunes and Merrie Melodies drew their storylines from Warner's vast music library. Between 1934 and 1943, Merrie Melodies were produced in color and Looney Tunes in black and white. After 1943, both series were produced in color and became virtually indistinguishable, varying only in their opening theme music and titles. Both series made use of the various Warner Bros. cartoon characters. By 1937, the theme music for Looney Tunes was "The Merry-Go-Round Broke Down" by Cliff Friend and Dave Franklin, and the theme music for Merrie Melodies was an adaptation of "Merrily We Roll Along" by Charles Tobias, Murray Mencher and Eddie Cantor. In 1929, to compete against Walt Disney's Mickey Mouse short cartoons, Warner Bros. became interested in developing a series of animated shorts to promote their music. They had recently acquired Brunswick Records along with four music publishers for US$28 million (equivalent to $420 million in 2019) and were eager to promote this material for the sales of sheet music and phonograph records. Warner made a deal with Leon Schlesinger to produce cartoons for them. Schlesinger hired Rudolf Ising and Hugh Harman to produce the first series of cartoons. Schlesinger was impressed by Harman's and Ising's 1929 pilot cartoon, Bosko, The Talk-Ink Kid. The first Looney Tunes short was Sinkin' in the Bathtub starring Bosko, which was released in 1930. When Harman and Ising left Warner Bros. in 1933 over a budget dispute with Schlesinger, they took with them all the rights of the characters and cartoons they had created. A new character called Buddy became the only star of the Looney Tunes series for a couple of years. New directors including Tex Avery, Friz Freleng and Bob Clampett were brought in or promoted to work with animators in the Schlesinger studio, with Avery's unit housed in a bungalow the animators dubbed "Termite Terrace." In 1935 they debuted the first major Looney Tunes star, Porky Pig, along with Beans the Cat in the Merrie Melodie cartoon I Haven't Got a Hat directed by Friz Freleng. Beans was the star of the next Porky/Beans cartoon Golddiggers of '49, but it was Porky who emerged as the star instead of Beans. The ensemble characters of I Haven't Got a Hat, such as Oliver Owl, and twin dogs Ham and Ex, were also given a sampling of shorts, but Beans and Porky proved much more popular. Beans was later phased out when his popularity declined, leaving Porky as the only star of the Schlesinger studio. The debuts of other memorable Looney Tunes stars followed: Daffy Duck in Porky's Duck Hunt (1937), Elmer Fudd in the Merrie Melodies short Elmer's Candid Camera (1940), and Bugs Bunny in the Merrie Melodies short A Wild Hare (1940). Bugs initially starred in the color Merrie Melodies shorts following the success of A Wild Hare in 1940, and formally joined the Looney Tunes series with the release of Buckaroo Bugs in 1944. Schlesinger began to phase in the production of color Looney Tunes with the 1942 cartoon The Hep Cat. The final black-and-white Looney Tunes short was Puss n' Booty in 1943 directed by Frank Tashlin. The inspiration for the changeover was Warner's decision to re-release only the color cartoons in the Blue Ribbon Classics series of Merrie Melodies. Bugs made a cameo appearance in 1942 in the Avery/Clampett cartoon Crazy Cruise and also at the end of the Frank Tashlin 1943 cartoon Porky Pig's Feat, which marked Bugs' only official appearance in a black-and-white Looney Tunes short. Schlesinger sold his interest in the cartoon studio in 1944 to Warner Bros. and went into retirement; he would die five years later. More Looney Tunes characters were created (most of which first appeared in Merrie Melodies cartoons) such as Tweety (debuted in 1942's A Tale of Two Kitties), Sylvester (debuted in 1945's Life with Feathers), Yosemite Sam (debuted in 1945's Hare Trigger), Pepé Le Pew (debuted in 1945's Odor-able Kitty), Foghorn Leghorn (debuted in 1946's Walky Talky Hawky), Marvin the Martian (debuted in 1948's Haredevil Hare), Wile E. Coyote and the Road Runner (debuted in 1949's Fast and Furry-ous), Granny (debuted in 1950's Canary Row), Speedy Gonzales (debuted in 1953's Cat Tails for Two), Witch Hazel (debuted in 1954's Bewitched Bunny), and the Tasmanian Devil (debuted in 1954's Devil May Hare). During the mid-late 1960s, the shorts were produced by DePatie–Freleng Enterprises (and Format Productions) (1964–1967) and Warner Bros.-Seven Arts (1967–1969) after Warner Bros. shut down their animation studio. The shorts from this era can be identified by their different title sequence, featuring stylized limited animation and graphics on a black background and a new arrangement, by William Lava, of "The Merry-Go-Round Broke Down". The change in the introductory title cards was possibly to reflect the switch in the animation style of the shorts themselves. The original Looney Tunes theatrical series ran from 1930 to 1969 (the last short being Bugged by a Bee, by Robert McKimson). The Looney Tunes series' popularity was strengthened even more when the shorts began airing on network and syndicated television in the 1950s, under various titles and formats. However, the Looney Tunes shorts were edited, removing scenes of violence (particularly suicidal gags and scenes of characters doing dangerous stunts that impressionable viewers could easily imitate), racial and ethnic caricatures (including stereotypical portrayals of African-Americans, Mexicans, Jews, Native Americans, Asians, and Germans as Nazis), and questionable vices (such as smoking cigarettes, ingesting pills, and drinking alcohol). Theatrical animated shorts went dormant until 1987, when new shorts were made to introduce Looney Tunes to a new generation of audiences. New Looney Tunes shorts have been produced and released sporadically for theaters since then, usually as promotional tie-ins with various family movies produced by Warner Bros. While many of them have been released in limited releases theatrically for Academy Award consideration, only a few have gotten theatrical releases with movies. In the 1970s through the early 1990s, several feature-film compilations and television specials were produced, mostly centering on Bugs Bunny and/or Daffy Duck, with a mixture of new and old footage. In 1976, the Looney Tunes characters made their way into the amusement business when they became the mascots for the two Marriott's Great America theme parks (Gurnee and Santa Clara). After the Gurnee park was sold to Six Flags, they also claimed the rights to use the characters at the other Six Flags parks, which they continue to do presently. In 1988, several Looney Tunes characters appeared in cameo roles in Disney's film, Who Framed Roger Rabbit. The more notable cameos featured Bugs, Daffy, Porky, Tweety, Sylvester and Yosemite Sam. It is the only time in which Looney Tunes characters have shared screen time with their rivals at Disney (producers of the film)—particularly in the scenes where Bugs and Mickey Mouse are skydiving, and when Daffy and Donald Duck are performing their "Dueling Pianos" sequence. In 1988, Nickelodeon aired all the unaired cartoons in a show called Looney Tunes on Nickelodeon until 1999. To date, Looney Tunes on Nickelodeon is the longest-airing animated series on the network that was not a Nicktoon. In 1996, Space Jam, a feature film mixing animation and live-action, was released to theaters starring Bugs Bunny and basketball player Michael Jordan. Despite a mixed critical reception, the film was a major box-office success, grossing nearly $100 million in the U.S. alone, almost becoming the first non-Disney animated film to achieve that feat. For a two-year period, it was the highest grossing non-Disney animated film ever. The film also introduced the character Lola Bunny, who subsequently became another recurring member of the Looney Tunes cast, usually as a love interest for Bugs. In 1997, Bugs Bunny was featured on a U.S. 32 cent postage stamp; the first of five Looney Tunes themed stamps to be issued. The Looney Tunes also achieved success in the area of television during this era, with appearances in several originally produced series, including Taz-Mania (1991, starring Taz) and The Sylvester & Tweety Mysteries (1995, starring Sylvester, Tweety, and Granny). The gang also made frequent cameos in the 1990 spinoff series Tiny Toon Adventures, from executive producer Steven Spielberg, where they played teachers and mentors to a younger generation of cartoon characters (Plucky Duck, Hamton J. Pig, Babs and Buster Bunny, etc. ), plus occasional cameos in the later Warner shows Animaniacs (also from Spielberg) and Histeria!. In 2000, Warner decided to make the Looney Tunes and Merrie Melodies library exclusive to fellow Time Warner properties, specifically Cartoon Network. Immediately prior to this decision, Looney Tunes shorts were airing on several networks at once: on Cartoon Network, on Nickelodeon (as Looney Tunes on Nickelodeon), and on ABC (as The Bugs Bunny and Tweety Show). The latter two had been particularly long-running series, and the Warner Bros. decision forced the two networks to cancel the programs. In 2003, another feature film was released, this time in an attempt to recapture the spirit of the original shorts: the live-action/animated Looney Tunes: Back in Action. Although the film wasn't financially successful, it was met with mixed-to-positive reviews from film critics and has been argued by animation historians and fans as the finest original feature-length appearance of the cartoon characters. In 2006, Warner Home Video released a new and Christmas-themed Looney Tunes direct-to-video film called Bah, Humduck! A Looney Tunes Christmas, a parody of Charles Dickens' A Christmas Carol. Other Looney Tunes TV series made during this time were Baby Looney Tunes (2002-05), Duck Dodgers (2003-05) and Loonatics Unleashed (2005-07). On October 22, 2007, Looney Tunes and Merrie Melodies cartoons became available for the first time in High-definition via Microsoft's Xbox Live service, including some in Spanish. From February 29 – May 18, 2008, many Looney Tunes artifacts, including original animation cels and concept drawings, were on display at the Butler Institute of American Art in Youngstown, Ohio, just off the campus of Youngstown State University. The exhibit had the studio come full circle, as the Warners were natives of the Youngstown area. At the 2009 Cartoon Network upfront, The Looney Tunes Show was announced. After several delays, the series premiered on May 3, 2011. Produced by Warner Bros. Animation, the series centers on Bugs and Daffy as they leave the woods and move to the suburbs with "colorful neighbors" including Sylvester, Tweety, Granny, Yosemite Sam, etc. The series introduced the character Tina Russo, a duck who becomes Daffy's girlfriend. The show also features 2-minute music videos titled respectfully "Merrie Melodies" (as a tribute to the Looney Tunes sister shorts) which features the characters singing original songs, as well as CGI animated shorts starring Wile E. Coyote and the Road Runner (which were removed after the first season). The series was cancelled after its second season. Also, Wile E. Coyote and the Road Runner returned to the big screen in a series of 3-D shorts that preceded select Warner Bros. films. There were six in the works that began with the first short, Coyote Falls, that preceded the film Cats & Dogs: The Revenge of Kitty Galore, which was released on July 30, 2010. On September 24, 2010, Fur of Flying preceded the film, Legend of the Guardians: The Owls of Ga'Hoole, and on December 17, 2010, Rabid Rider preceded the film, Yogi Bear. On June 8, 2011, Warner Bros. Animation announced that there will be more Looney Tunes 3-D theatrical shorts; the first titled Daffy's Rhapsody with Daffy Duck and Elmer Fudd, the next being I Tawt I Taw a Puddy Tat with Sylvester, Tweety, and Granny. Daffy's Rhapsody was to precede the film Happy Feet Two, until the studio decided to premiere I Tawt I Taw a Puddy Tat instead. Daffy's Rhapsody instead premiered in 2012, preceding Journey 2: The Mysterious Island. All five shorts were directed by Matthew O'Callaghan. In 2012, several announcements were made about a Looney Tunes reboot film titled Acme, in development. Former Saturday Night Live cast member Jenny Slate was said to be on board as writer for the new movie. Jeffrey Clifford, Harry Potter producer David Heyman, and Dark Shadows writers David Katzenberg and Seth Grahame-Smith were slated to produce the film. On August 27, 2014, writers Ashley Miller and Zack Stentz were hired to script the film, directors Glenn Ficarra and John Requa were in talks to direct the film, while actor Steve Carell was rumored to be starring in a lead role. Despite this, the film has yet to enter production. At the 2014 Cartoon Network upfront, another series titled Wabbit: A Looney Tunes Production (later New Looney Tunes) was announced. Starring Bugs Bunny, the series premiered on both Cartoon Network and its sister channel Boomerang in Fall 2015. The series has had an unusually slow rollout, with the series having moved to the Boomerang streaming service in 2017, and dozens of episodes still unreleased as of June 2018. On June 11, 2018, another series, titled Looney Tunes Cartoons, was announced by Warner Bros. Animation. Set for release in 2019 on both linear and streaming television platforms, its first season would feature "1,000 minutes of new one-to-six minute cartoons featuring the brand's marquee characters", voiced by their current voice actors in “simple, gag-driven and visually vibrant stories” that are rendered by multiple artists employing “a visual style that will resonate with fans”, most noticeably having a style reminiscent to the styles of Bob Clampett, Chuck Jones, Friz Freleng and Robert McKimson. Sam Register, president of Warner Bros. Animation and Peter Browngardt, creator of Uncle Grandpa, would serve as executive producers for the series. In the 1980s, the shorts received VHS releases, with the pre-1948 shorts released by MGM/UA Home Video and the post-1948 shorts released by Warner Home Video. In 2003, Warner Home Video began releasing select shorts on DVD, aimed at collectors, in four-disc sets known as the "Looney Tunes Golden Collection". This continued until 2008, when the final volume of the Golden Collection was released. Then in 2010 until 2013, the company released the "Looney Tunes Super Stars" DVDs. There have been numerous complaints regarding the "Super Stars" releases however, particularly the first two, having the post-1953 shorts in a 16:9 widescreen format. The last DVD in the "Super Stars" series was "Sylvester and Hippety Hopper: Marsupial Mayhem", released on April 23, 2013. Between 2010 and 2011, the shorts were respectively saw the releases of the "Essential Bugs Bunny" and "Essential Daffy Duck" DVDs. In 2011, the shorts were released on Blu-ray Disc for the first time with the "Looney Tunes Platinum Collection" series. On September 19, 2017, Warner Home Video's Warner Archive Collection released the five-disc "Porky Pig 101" DVD-set. In 1933, Harman and Ising left, taking the rights to the Bosko characters with them. However, Warner retained the rights to the cartoons and the Looney Tunes and Merrie Melodies brandnames, leaving their former producer Leon Schlesinger to start his own Warner Bros. studio and continue the Looney Tunes series. With their retained Bosko rights Harman and Ising began making cartoons at Metro-Goldwyn-Mayer in 1934, until they were fired in 1937 due to a lack of success. They proceeded to form their own studio to create MGM cartoons. Time Warner eventually acquired the Bosko characters from Harman and Ising's estates. Meanwhile, the Schlesinger studio continued to make popular cartoons until 1944 when Schlesinger sold his studio to Warner Bros. Since then, Warner Bros. has owned all rights to all post-1933 characters created by Leon Schlesinger Productions and Warner Bros. Cartoons. The rights to individual cartoons however are in other hands. In 1955, Warner Bros. sold its black-and-white Looney Tunes (plus the black-and-white Merrie Melodies made after Harman and Ising left) into television syndication through their sale of the cartoons to Guild Films. The copyright to those cartoons were assigned to Sunset Productions. These cartoons were distributed by Guild Films until it went bankrupt and was bought by Seven Arts. Seven Arts bought WB, and WB gained rights to the black and white cartoons. In 1956, Associated Artists Productions (a.a.p.) acquired for television most of Warner Bros' pre-1950 library, including all Merrie Melodies (except for those sold to Sunset and Lady, Play Your Mandolin!) and color Looney Tunes shorts that were released prior to August 1948. Unlike the sale to Sunset Productions, a.a.p. was allowed to keep the Warner titles intact and simply inserted an "Associated Artists Productions presents" title at the head of each reel (as a result, each Merrie Melodies cartoon had the song "Merrily We Roll Along" playing twice). Two years later, United Artists bought a.a.p. (which also bought Paramount's Popeye films) who merged the company into its television division; United Artists Television. In 1981, UA was sold to MGM, and five years later, Ted Turner acquired the pre-May 1986 MGM library, as well the rights to the a.a.p. library. In 1996, Turner's company, Turner Broadcasting System (whose Turner Entertainment division oversaw the film library), was purchased by Time Warner (now AT&T's WarnerMedia) who also owned Warner Bros. Today, Warner Home Video holds the video rights to the entire Looney Tunes/Merrie Melodies animated output by virtue of WarnerMedia's ownership of Turner Entertainment. Starting in 1960, the cartoons were repackaged into several different TV programs that remained popular for several decades before being purchased by Turner Broadcasting System. Turner's Cartoon Network reran the cartoons from their launch in 1992 until 2004, and again from 2009 until 2017. An early 2000s version of The Looney Tunes Show, a packaged show produced by Warner Bros. Animation for the network, was broadcast from 2001 to 2004. The show featured shorts from the original Looney Tunes and Merrie Melodies theatrical cartoon series. As of 2013, the classic cartoons are currently airing on Cartoon Network's sister channel, Boomerang. Five dozen Looney Tunes and Merrie Melodies shorts from before December 1943 have lapsed into the public domain and are thus freely distributed through various unofficial releases. Many of these public domain cartoons on unofficial releases are of poor video and audio quality. A handful of Looney Tunes and Merrie Melodies shorts are no longer aired on American television, nor are they available for sale by Warner Bros. because of racial and ethnic stereotypes of black people, American Indians, Asians such as Japanese (especially during WWII, as in Tokio Jokio and Bugs Bunny Nips the Nips), Chinese, Germans and Italians. Eleven cartoons were withdrawn from distribution in 1968 that prominently featured stereotypical black characters (and a few passing jokes about Japanese people, as in Coal Black and de Sebben Dwarfs and Jungle Jitters) and are known as the Censored Eleven. In 1999, all Speedy Gonzales cartoons were removed from airing on Cartoon Network because of their alleged stereotyping of Mexicans. Many Hispanics protested that they were not offended, and fondly remembered Speedy Gonzales cartoons as a representation of their youth and nation's individuality; these shorts were made available for broadcast again in 2002. In addition to these notorious cartoons, many Warner Bros. cartoons contain fleeting or sometimes extended gags that make reference to racial or ethnic stereotypes. The release of the Looney Tunes Golden Collection: Volume 3 includes a disclaimer at the beginning of each DVD in the volume given by Whoopi Goldberg which explains that the cartoons are products of their time and contain racial and ethnic stereotypes that "were wrong then and they are wrong today", but the cartoons are presented on the DVD uncut and uncensored because "editing them would be the same as denying that the stereotypes existed." Plus various one-shots, specials and appearances in anthology comics like March of Comics, Top Comics and Dell Giant from various Western Publishing imprints. The numbering of the Dell issues generally includes 3-4 appearances in Dell's Four Color comics. ^ "Field Guide To Titles And Credits". web.archive.org. Archived from the original on February 29, 2008. Retrieved August 16, 2015. ^ "Bugs Bunny". Hollywood Chamber of Commerce. Retrieved June 28, 2012. ^ "TV Guide magazine's 60 greatest cartoons of all time". Fox News. September 24, 2013. ^ Adamson, Joe (1990). Bugs Bunny: 50 Years and Only One Grey Hare. Henry Holt. ISBN 0-8050-1855-7. ^ "Movie Reviews: Space Jam". Retrieved on January 23, 2008. ^ "Space Jam (1996)". Box Office Mojo. Internet Movie Database. Retrieved December 2, 2011. ^ a b Beck, Jerry (2005). The Animated Movie Guide. Chicago, Illinois: Chicago Review Press. ^ Looney Tunes: Back in Action. Boxofficemojo.com. Retrieved on January 25, 2008. ^ "Looney Tunes: Back in Action :: rogerebert.com :: Reviews". Rogerebert.suntimes.com. November 14, 2003. Retrieved October 29, 2012. ^ David Edelstein (November 14, 2003). "Movie Review: Looney Tunes: Back in Action". Slate. slate.com. Archived from the original on April 8, 2008. Retrieved February 2, 2008. ^ "From Looney Tunes and iCarly to Shrek and SpongeBob SquarePants, Xbox 360 Launches Massive Library of Family Games and Entertainment" (Press release). Microsoft. October 22, 2007. Archived from the original on June 4, 2011. Retrieved November 6, 2007. ^ "Youngstown News, Butler Institute goes Looney Tunes". Vindy.com. February 24, 2008. Retrieved October 29, 2012. ^ "TAG Blog: At the 'Toon Factory of the Brothers Warner". animationguildblog.blogspot.co.uk. Retrieved March 11, 2015. ^ FrantzEdCharles (July 29, 2014). "No Season 3 for the Looney Tunes Show". Twitter. Retrieved December 30, 2014. ^ "More 3D Looney Tunes Shorts On The Way". ComingSoon.net. Retrieved October 29, 2012. ^ Vary, Adam B. "Looney Tunes short with Tweety Bird, Sylvester - EXCLUSIVE CLIP | Inside Movies | EW.com". Insidemovies.ew.com. Retrieved October 29, 2012. ^ Kit, Borys (September 19, 2012). "Former 'SNL' Star to Write 'Looney Tunes' Reboot Film (Exclusive)". hollywoodreporter.com. Retrieved October 13, 2012. ^ Anderson, Paul (September 19, 2012). "Looney Tunes Movie Back In Action". Big Cartoon News. Archived from the original on December 9, 2012. Retrieved September 19, 2012. ^ "Acme 'Looney Tunes' Movie Finds New Momentum with 'X-Men: First Class' Writers". hollywoodreporter.com. August 27, 2014. ^ Steinberg, Brian (June 29, 2015). "Bugs Bunny, Scooby Doo Return To Boost Boomerang". Variety. ^ Patrick Hipes (June 11, 2018). "'Looney Tunes' Getting Short-Form Revival At WB Animation". Deadline Hollywood. ^ Billboard. Nielsen Business Media, Inc. p. 6. ISSN 0006-2510. Retrieved October 10, 2014. ^ You Must Remember This: The Warner Bros. Story. 2008. p. 255. ^ " "Archived copy". Archived from the original on December 2, 2010. Retrieved November 12, 2010. CS1 maint: Archived copy as title (link)". Looney Tunes on Television. Retrieved November 7, 2010. ^ "The new Nick & More! is coming this month!". tvschedulearchive.com. Retrieved August 16, 2015. ^ ""The Warner Brothers: Albert, Harry, Jack, and Sam Warner"". Archived from the original on October 18, 2007. Retrieved January 23, 2008. ^ Emling, Shelly (June 21, 2002). "Cartoon Network putting Mexican mouse back in the lineup". Milwaukee Journal Sentinel. Retrieved November 6, 2010. ^ "National Film Registry: 1989–2007". loc.gov. Retrieved August 16, 2015. ^ "1949 Academy Awards". Retrieved June 26, 2013. ^ "1958 Academy Awards". Retrieved September 20, 2007. Wikimedia Commons has media related to Looney Tunes.